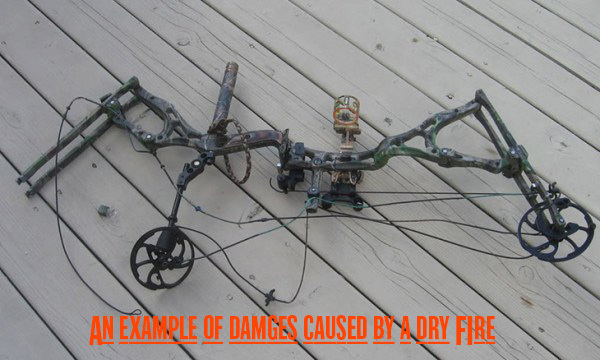 One of the most amazing demonstrations of pure energy and power that I have ever personally seen with my own eyes is that of a dry fry on a compound bow. For those of you that might not know, a dry fire is a term used to classify the act of shooting a bow without an arrow properly nocked on the string. When you shoot a bow, the bow itself creates an incredible amount of energy. That energy is suppose to transfer into the arrow at the time of the shot but if the arrow is not there to take all of that energy it will instead transfer into the bow. This will result in a variety of destruction ranging from a very loud, horrible noise but no damage, all the way to everything but the riser of the bow needing replaced. This is a very simplistic way of explaining a dry fire of coarse, but hopefully you get the idea. When someone new decides to get into archery it can be an exciting time for them. I personally love helping new shooters get setup and on their way to enjoying our sport long term. Sometimes in all that excitement it can be easy to overlook a few really important rules that need to be followed in order to safely operate that shiny new bow. A big one being NEVER SHOOT WITHOUT AN ARROW NOCKED, and another being ALWAYS FLEX TEST YOUR ARROWS BEFORE SHOOTING. In the middle of all that excitement accidents can find a way to happen sometimes. To combat this possibility we do our best to include stickers, fliers and anything else we can think of that may help warn about the possible dangers of not doing certain things correctly with that new bow. I do have to admit something though. Even after all of our leg work trying to prevent an accident from happening, I can fully understand how all those warnings can be over looked in all the excitement. I have been a kid on Christmas morning myself at some point, and I fully understand the desire to rip off all that paper so we can get outside to play with whatever new toy we just got. WITH ALL OF THAT OUT OF THE WAY LETS JUMP RIGHT INTO THE LIST! NUMBER 3 - THE VERY FIRST SHOT! Blew up on the first shot! A couple of years ago I received a phone call from a very nice man that had just recently received a brand new PSE Brute X. There was an obvious shake to his voice and to be honest it was one that I have heard before so I had a feeling of what he may be getting ready to say. It was the sound people have after they just witnessed their first dry fire. It is a scary thing and it can shake people up pretty bad. I asked him if there was anything I could help him with and he said yes. He described how happy he was to have received the bow but told me how terribly upset he was to have his new bow "explode into pieces" on the very first shot. At this point he took on a defensive tone and started asking me how I plan to fix his new (broken) bow. asap. Now I should probably give you some inside information on how we approach this type of situation here at the shop. When a bow explodes it is a very serious subject and it is one that we do not take lightly. Our first coarse of action is to immediately start trying to figure out what may have happened to cause such a malfunction. We have to look for any signs that point to either user error or a legitimate bow defect. It can be tricky but we have a solid process to iron out the details of what happened. The very first question we ask is always, "what happened to the arrow?" This one question allows us to decipher the situation and it also helps us rule out a few things. For example if someone calls and says "the bow string broke at full draw". We would ask them the very same question right off the bat. What happened to the arrow when this incident occurred? In the case of a string breaking at full draw the arrow would have not done much of anything and instead would have stayed nocked on the string or possibly fallen to the shooters feet. This is because the string broke at full draw, before the string had a chance to move forward at all. This would mean that there would have been ZERO forward momentum created by the bow to fire the arrow/shot. If this is the answer we get from the customer then we know it is most likely what happened but if the answer is that the arrow still managed to fire, then we know something else caused the problem. I started of by making sure the customer was ok, once I knew for sure that he had not been hurt I started trying to figure out the cause. I asked our first go to question like I had done so many times before. "What happened to the arrow when this happed?" The customer's reply was a new one in my book. "Well that is exactly why I am so mad right now" he said "I paid a fortune for this bow and it blew up on my very first shot. I didn't even get a chance to put an arrow in the dang thing because it blew up on the very first shot in my living room." He continued by reiterating that he wants to know how we plan to fix the "obviously defected" product we had just shipped him. Now he was starting to imply that he had lost his trust in his new bow and would maybe even want a new one because the bow he just received was, he repeated, "obviously defective." I gathered my thoughts for a moment in order to make sure I had heard correctly. After a couple of quite seconds I asked very politely. "Was there an arrow nocked on the string during this first shot?" He made a low groaning noise for a second. It felt clear to me that he was pretty convinced he had done nothing wrong and I knew I had to approach this subject with a certain finesse. "I just told you" he said " I hadn't even had a chance to try it with an arrow because it blew up on the first shot." I very politely followed his answer up by asking if he had ever heard of a dry fire before. He responded with a clear uncertainty to his voice, "yes, of coarse I have." the man said. The next question I asked was if he had read the warning stickers we included with/on the bow. "Don't try to turn this around on me" he said in with an aggravated tone to his voice! I gave the situation another few calm seconds to simmer down in hopes of not causing an argument with the man. After a few moments, I politely asked the man again if he had ever heard of a dry fire. At first he said yes but once I started explained what a dry fire actually was he finally admitted that he hadn't read anything about them and that he was just super excited to get his hands on his new bow. He told me that he had no idea shooting without an arrow was dangerous and that it could cause damage to a bow. Once it had sunk in to him that the damage was caused by user error he started to calm down a bit. Eventually he started to laugh it off and even owned up to what had happened. I explained that there is no shame in this kind of thing at all, and I explained how it has honestly happened to the best of us in one way or another at some point. keep in mind that bows can always be fixed. Thankfully he was not injured when the bow came apart. 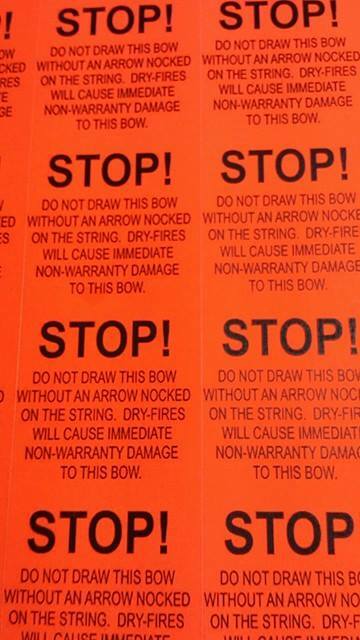 These are safety stickers that we use to help warn against pulling the bow back without and arrow. We use several stickers for every bow that leaves the shop. One of them actually goes on the arrow rest and it has to be removed before the bow can be shot. Excitement gets the best of us all sometimes. Dry fires are not covered under warranty but since he was so honest and cool about the situation, we did everything we possibly could to help keep it as cheap and painless as possible. NUMBER 2 - LOCKED UP TIGHT! Locked at full draw! This particular story was a scary situation for me and the customer involved. What happened to this customer was very rare but it can pop up on a small handful of bows out there, that is of coarse, if the stars line up just right to allow for it. Certain bows can get just a little too much cam lean on the bottom cam and this will allow the cable to slip behind the draw stop peg while the bow is being brought to full draw. When this happens everything will feel perfectly normal until you go to let the bow back down or to fire a shot. When you try to do this you will realize the cable will not be able to get back in front of the draw stop peg. This effectively causes what we call a "lock up". This will leave the unlucky shooter holding a bow at full draw completely unable to release it back to the resting position. Think for just a second all of the terrible outcomes this could lead to. The biggest concern for us is safety so it can be a scary song and dance for us when this sort of thing shows its ugly head. Here is what happend! A few years ago I received a call from a man in Colorado. He had ordered a Diamond Outlaw from us a couple of weeks prior and his son had dry fired it shortly after receiving it. The man took the bow to his local shop for some minor repair work and all seemed well. Unfortunately the bow was not fixed correctly and we were all about to find out about it the hard way. I could hear that he was freaking dead out from the moment he started speaking. He described the situation that he was dealing with in detail and I knew from experience what was going on. We had a locked up bow, but this one had an unexpected variable at play. The man explained that he had drawn back the bow just to feel how comfortable the draw weight setting was but now he was not able to let the bow back down to the resting position. He told me that there was NOT an arrow nocked and that he was inside his house at the time. At this point I realized just how serious of a situation this really was. HE STILL HAD THE BOW IN HIS HANDS! The man had the bow at full draw but to him it felt like there was almost zero tension on the bow string. However! If he let go for even a second and that cable decided to shift it would lead to a dry fire with him right there next to the bow. I asked the man how he even managed to call us and it turned out that he had his wife call us and put us on speaker to see if we could help. Unfortunately we knew that without a bow press and the correct tools there was really no easy way out of this one. I explained to the man that the bow could always be repaired and that his safety and health was way more important. After a few more minutes of discussing a plan we finally decided on a coarse of action. I advised the customer to find a safe spot with no one around, count to three and to toss that time bomb as far away from himself as possible. He was understandably nervous about the idea but it really was the only safe option we had. I was still on speaker when he said "ok I am ready." I told him I would count to three and for him to toss it as fast and hard as he could. On the count of three he tossed the bow and after a moment of silence the unmistakable BABOOM of a bow's string smacking the string stop without an arrow nocked echoed over the phone line. Thankfully the man was completely fine but the bow had seen better days. The damage the bow sustained was nothing that we couldn't easily fix for him though. As a matter of fact Diamond actually covered everything under warranty even though the problem was caused by the shop that fixed the bow improperly after the first dry fire. Diamond handled the parts and we covered the labor and before long he had his bow back as good as new and at the end of the day it all worked out fine. Thankfully! 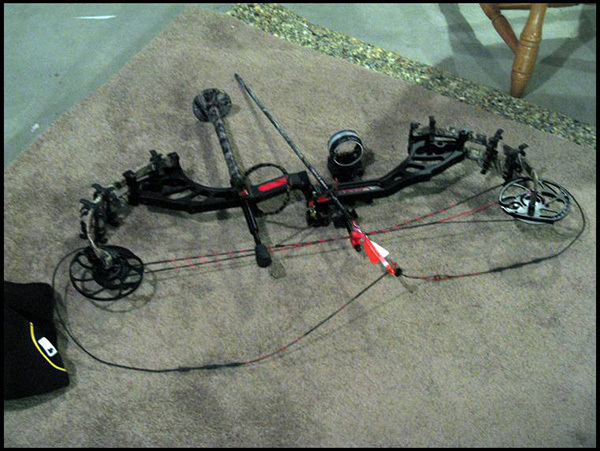 This is a picture I found online that demonstrates exactly what I am talking about when I am referring to a bow "locking up". This shooter had an arrow nocked but the string is still completely limp in the picture. This is a very dangerous situation because if what ever has it locked up decides to slip the bow will expand. Just a little more context! Viewer discretion is advised on this one, folks. In the archery world there is a VERY important rule that anyone shooting a compound bow with carbon arrows needs to follow in order to enjoy the sport safely. This VERY important rule refers to the act of checking your carbon arrows for damage before each shot. You do this by simply grabbing the arrow on each end, one hand on the field tip side and the other hand on the fletching side. Then you simply bend the arrow a few times. Don't break it over your knee or anything but feel free to put some strength behind the bending process during the test. The arrow will not break unless it is already damaged and you certainly would rather it break now instead of during a shot. This process is called "flex testing" your arrow and even though it looks strange, it is actually a very effective way of making sure your arrow is safe to shoot. When you fire an arrow your bow puts a serious amount of energy into that arrow. and this causes the arrow to flex and bend like crazy. This test is meant to simulate what the arrow goes through while being fired. A carbon arrow that is not damaged in any way is extremely strong and durable. If you perform the "flex test" on an arrow that is NOT damaged, the arrow will simply bend/flex without making any (serious) cracking noises or showing any sign of damage at all. At this point you would know this particular arrow is safe to shoot because if an arrow is not damaged then it will NOT break during the flex testing process. However! If you were to have an arrow that was damaged in some way and you went to flex test it, the most likely result is that the arrow would simply snap in half or at the very least, show signs of being weak. Here is the important thing to remember if you find a damaged arrow with this method. The arrow you just broke in half by flex testing it with your bare hands would have been put through a much more aggressive version of the "flex test" once you fired it. In other words, that arrow would have snapped in half when you fired the bow, just as soon as the energy from the bow tried to transfer into the compromised arrow shaft. This causes what we call an "effective dry fire" because even though the arrow was nocked on the string, it did not take the bows energy like it should have and all of that energy is what will cause damage to the bow. Unfortunately a dry fire is usually the least of your worries if an arrow decides to snap during a shot, and that is what leads me to my next story. WITH ALL OF THIS SAID. LETS MOVE ONTO NUMBER ONE. This is a safety flyer that we made here in the shop on the subject of flex testing your carbon arrows. 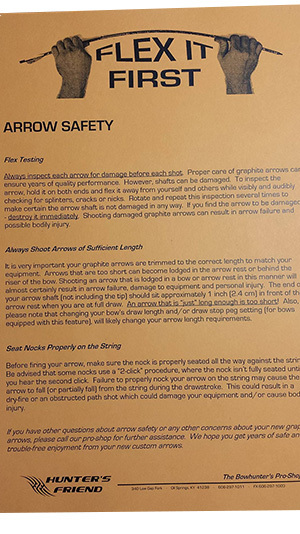 Every single order placed with Hunter's Friend that includes custom carbon arrows will have at least one of these safety sheets included with it. Sometimes we will toss two or three of these sheets in an order just to be safe. NUMBER 1 - A LESSON LEARNED THE HARD WAY! Now that we all understand the concept of "flex testing" and the possible consequences of NOT flex testing your arrows I think it is time to talk about my craziest phone call that I can remember. This one happened several years ago in 2010 ish I believe. It was not too long after I had first started working on phones in the Sale's Office. I was still pretty green to some possible scenarios that may pop up. At this particular time our shop was staying open until 10pm EST because it was bow season and we were very busy but after 7pm EST I would fly solo for the rest of the shift. With around 45 minutes left before 10pm I recieved a phone call from a very calm and very polite man. The phone call starts out perfectly normal just like I had done so many times before and after some small talk I asked him what I could help him with. His response was unexpected to say the least. "Well I am in the emergency room" he said. At this point I had no idea why this would even be relevant in any way, but I was about to find out. " You know those orange papers you guys send out? The ones that talk about testing your arrows before you shoot them?" Yes I replied. "Well I may have read mine a bit too late" he said. Then he started to explain what had happened. He had been shooting with his brother and he was doing really well. So well in fact that he was actually managing to group super close together, so close that his arrows were touching each other in the target. (NOTE: This is always a good reason to check your arrows because banging together in the target can hurt them.) "I was going to shoot one more set and call it a night" he said " but as I shot the next arrow I heard a terrible sound. At first I thought my bow had exploded" he said "but when I opened my eyes the bow was still intact. I tilted the bow to look at the bottom cam and that's when I noticed the blood dripping from the bottom of the bow." It had happened so fast that he did not even realize it, or even feel it right away. The arrow had become damaged at some point and collapsed under the power of the shot. The arrow broke approximately 4" above the fletchings causing the arrow to split in two halves. The front half of the arrow managed to fly away from the bow a little ways. Unfortunately this also caused the back half of the arrow to become a jagged razor sharp collection of broken carbon fiber strands, and it was heading straight for the hand the man was using to grip the bow. 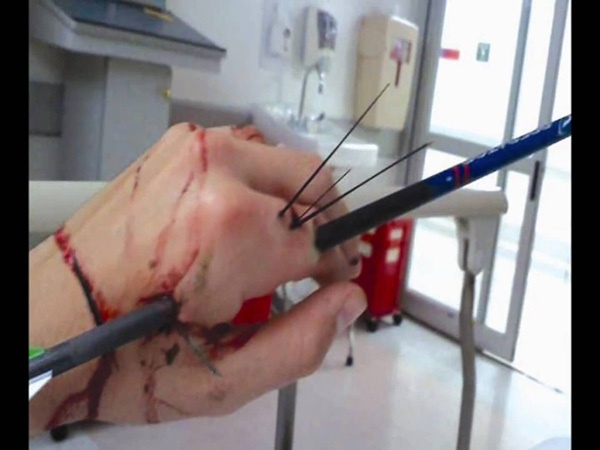 The force of the shot drove the tip of the broken shaft all the way through his hand and buried it up to where the fletchings were actually hanging out on both sides of his hand. It was the first time I had ever ran into this situation and it freaked me completely out! I really wish it was the last time I would have seen it but unfortunately it tends to pop up from time to time when an arrow is not properly tested. I have to give credit where it is due and admit that this man handled it all like a champ. He was literally laughing about it in the ER on the phone with me. He was strangely calm and collected considering what had just happened. He later told me that they had been pulling tiny shards of carbon fiber out of his hand for well over an hour and they still had a long way to go to get it all out. He called me again a few weeks later to let me know that he was in good shape and was still shooting his bow everyday. Unfortunately I no longer have a copy of the pictures this particular customer sent to me of his hand but since this was not an isolated incident I was able to find another example online. This is a picture I found of someone else that suffered the same fate. Here is another one I found. Just to really give you an idea of how crappy this would actually be to go through. FLEX TEST THOSE ARROWS PEOPLE! These were just a small sample of all the interesting stories and situations I have ran into over my years of working phones for the worlds largest independent archery pro shop. I would like to take this chance to mention that all three of the men that my stories refer to were all extremely cool about everything in the end. To be honest I have not dealt with very many "jerks" at all over the years working here and that just goes to show you what types of people are attracted to our awesome sport. In the archery world most people are just cool, calm and down to earth people that enjoy shooting their bows just like we do. That is, with out a doubt, one of my favorite things about our industry. 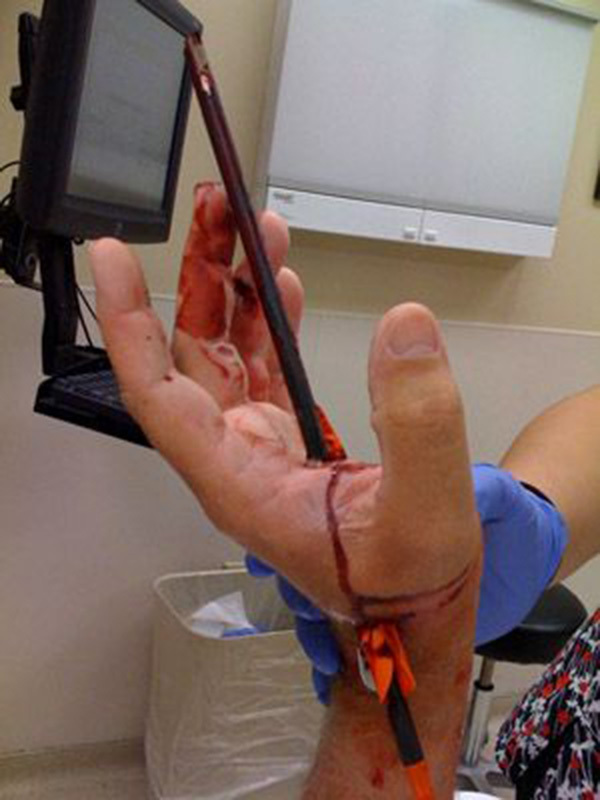 If nothing else be sure to beware of the dangers that can come from not flex testing an arrow or from not having an arrow properly nocked on your bow string at all during a shot. They are both very easy mistakes to avoid and it only takes a second to prevent them.